Although many injuries occur during flight, aviation accidents are most likely to occur during departure and arrival. In order to take off and land safely, pilots must stay in constant communication with air traffic controllers and ground crews—and even a small mistake can cause a tragic runway accident. As many as half of all aviation accidents occur during final approach, landing, and takeoff procedures. Unfortunately, the most common reason for these incidents is human error. Runway incursions. Runway incursions are caused by the incorrect presence of a plane, vehicle, individual, or other object on any surface designated for landing and takeoff. Even if the pilot is able to avoid a collision, passengers can still be injured as the pilot performs evasive action, especially if luggage falls from overhead bins or passengers are unbuckled during emergency maneuvers. Runway excursions. Commercial aircraft travel at hundreds of miles per hour, and it takes experience and skill to bring a jet engine to a safe stop. A pilot who miscalculates the initial approach can veer off the tarmac or completely miss the runway, rolling over rough terrain or into ditches or bodies of water. Inclement weather often contributes to runway excursions, while defects in the surface of the runway can make these accidents more severe. Collisions. Planes may collide with many different objects on the tarmac, including luggage transport vehicles, construction equipment, fences and barriers, and other aircraft. With enough force, a collision can cause the plane to catch fire, roll over, or cause the landing gear or tail section to separate from the rest of the aircraft, ejecting passengers and flight attendants. Commercial airlines have a duty to prevent unauthorized or unapproved movement on their runways that could affect the safety of a flight. 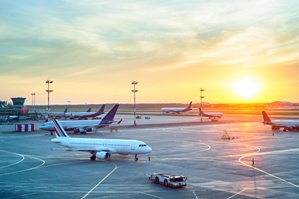 If an accident occurs during takeoff or landing, the airline may be held liable for unsafe operating procedures and the negligent actions of its employees. Operational incidents. Air traffic controllers are the first line of defense against airplane collisions and runway crashes. As Federal Aviation Administration (FAA) employees, air traffic controllers are required to follow strict regulations to ensure that planes maintain a safe distance from any obstacles and from one another. If an air traffic controller allows planes to travel too closely together or clears an aircraft to take off or land on an improper runway, the controller could be held liable for injuries and face penalties under federal law. Pilot error. Pilot errors are often a result of fatigue, impairment, or a simple lack of experience. A pilot who attempts a risky maneuver, takes an unauthorized path to an airport gate, approaches an airport at the wrong altitude or airspeed, or violates FAA regulations may be held responsible for his or her actions. Unauthorized movement or objects. Even when an airport is extremely busy, runways should never have any personnel or objects on them unless they are needed for immediate departure. Anything left on the runway surface can potentially cause a serious incident, including pedestrians entering taxiways or vehicles moving across a runway without authorization from air traffic control. Mechanical failure. Aircraft require numerous components to work together perfectly, including electrical systems, landing gear, engine parts, and radio communications. Manufacturers of parts and aircraft can be held liable for defective plane designs or mechanical failure in a product liability claim. Poor runway maintenance. Airport operators have a duty to ensure that runway surfaces are clear, safe, and well-lit. Broken landing system lights, icy or slippery surfaces, and other maintenance issues can all be contributing factors in runway accidents. At GriffithLaw, we conduct a thorough investigation to determine who is responsible for your airline injury—and we do not collect any legal fees unless we recover compensation for you. Simply fill out the short contact form on this page to set up your no-cost injury consultation, or learn more about your rights in our free guide, The 10 Worst Mistakes You Can Make With Your Tennessee Injury Case.